Out of left field a thought came and blindsided my emotions. Words said by someone in the past replayed in my mind entangling me in a web of anger and hurt. Fortunately, I realized I have a choice. I could think about, whine about, and get mad about what they did, or I could cut the chains that tangle my emotions. Jesus has given a key to freedom, and forgiveness is the ax that cuts us free. As I forgave that person, I could feel the chains that tied me to that person, and the negative thoughts and emotions, lose their hold and I floated free. The weight released and I felt light as a feather. The person remained chained to their sin, but I was free. Jesus tells us, “If you forgive those who sin against you, your heavenly Father will forgive you. But if you refuse to forgive others, your Father will not forgive your sins.” ~ Matthew 6:14-15 (NLT) When we forgive, forgiveness leads to our freedom and our forgiveness. Satan wants us to think forgiveness lets the other person off the hook, but the only one unhooked is the one who forgives. When you forgive, the chain that binds you to that person is cut. 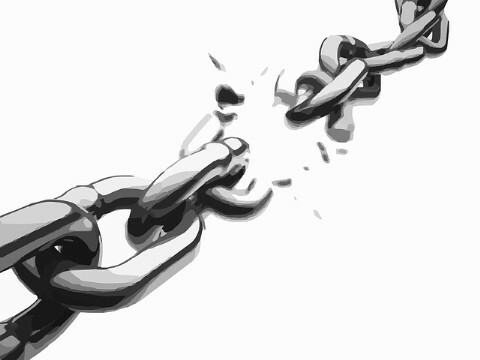 Jesus Christ gives forgiveness and freedom so you can cut the chain through forgiveness so you can fly free. Feeling chained? Cut the chain by forgiving so you can fly free.